Styled shoots are fun shoots for us. It's like a playground for San Diego Wedding Photographers and other wedding professionals. We get to pick out what dresses we want to photograph, no budget involved, the cake people get to let their imaginations run wild on cake forms and decorations, coordinators get to just go crazy in decorations. It's a fun time for all. We get to work with models who aren't worried that someone might see them before the wedding, we get to work at our own pace, all in all, an ideal day. The girl in this photo was not a professional model, rather she's one of the wedding coordinators assistants! 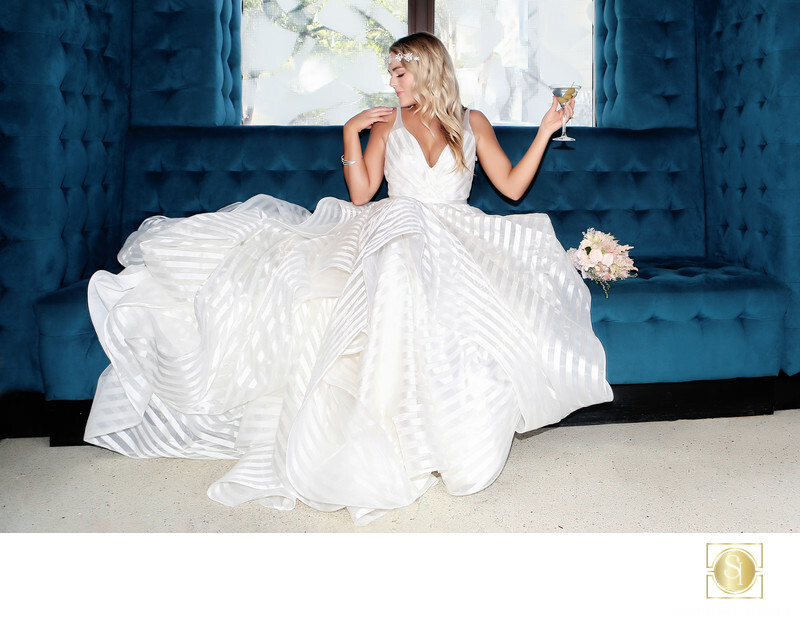 The gown we picked for this shot came from White Flower Bridal Boutique and is by designer Hayley Page. It fit our model perfectly and was so nicely suited to her overall, slightly beachy look. Beachy and San Diego are one and the same, so that worked out perfectly! The blue velvet of the alcove made the white of the dress and the tan girl stand out wonderfully. The image was shot with a Canon 5D mkIII with one 600 EX-RT on camera and two off camera, one to each side of the window. Location: Marriott Renaissance Hotel, San Diego Ca..